There has been considerable research into the Waltman family origins, and it is not without controversy. Most of the dispute relates to the immigrant Conrad Waltman, who is said to have become the founder of the Waltman Clan in the United States. He is claimed by some as a patriot, a private in the Revolutionary War, but this view is rejected by others who believe the man named "Conrad Waltman" who was in the war was a different person of the same name, apparently the grandson of the immigrant Conrad Waltman. This is the first of three chapters on the Waltman family of Northampton County, Pennsylvania. Part II of this presentation looks at the numeous children of Conrad Waltman, with special emphasis on his son Valentine Waltman and on Valentine's son Conrad Waltman (who is called "Conrad Waltman Junior" in this text for purpose of distinguishing the two men of the same name). Part III looks at Peter Waltman of Allentown, the son of Conrad Junior, and at Peter's son Joseph Waltman of Easton, and at his descendants. The first section, below, also contains a critique of the book The House of Waltman, by Lora S. LaMance. Was Conrad at Fort Washington? Which of the two Conrad Waltmans was in the Flying Camp? Lora Sarah Nichols LaMance (1857-1939), of Indiana, Missouri and later Florida, wrote a very impressive but contested book called The House of Waltman and its Allied Families in 1928. The LaMance account - 278 pages - has been the starting place for many research efforts on the Waltmans, and unfortunately it has generated substantial confusion and misinformation among the students of the family. The three parts of this presentation point out and correct a number of errors and misinterpretations in LaMance's work. Hers is an interesting story in itself. She not only did genealogical research but was a crusader for the Women’s Christian Temperance Union and a suffragette. A section on her life and family is included at the end of this chapter. Also included is a critique of her book on the Waltmans. Hannah Benner Roach (Mrs. Franklin Spencer Roach, 1907-1976), prominent in architectural circles in Philadelphia, turned to genealogical research in the 1950s. She taught courses at the Genealogical Society of Pennsylvania (GSP), based in Philadelphia, served as editor of its magazine and was a director of the society. The Hannah Benner Roach collection of research consumes 41 volumes in the library of the GSP. In 2002, long after her death, she was elected to the Hall of Fame of the National Genealogical Society, an honor accorded only one person per year. In 1961, Mrs. Roach was commissioned by Margaret Bright Wilkins to do research on the Waltman family, and she developed a substantial amount of new material. Some 50 pages of her notes on the Waltmans are stored in the original in the Historical Society of Pennsylvania and have been copied on microfilm at the GSP. Garry Heagy of Ontario, Canada, in 2008 was continuing his extensive research on the Waltman family, particularly the descendants of Conrad and Katherine Waltman. He is descended from Maria Barbara Waltman Gruber, a daughter of Conrad Waltman Junior. Many of the research conclusions in this paper are based on Garry's detailed work. Other Waltmans? LaMance and several other genealogists gave the impression that this Valentine Waldman and his son Conrad were the main source of all the Waldmans or Waltmans in America. The first sentence in her book began, “Nearly every Waltman is a descendant of one Valentine Waldman.” Nevertheless, there is evidence of other lines. Indeed, one genealogist has written that “the name of Waltman or Waldman is and was very common in the south of Germany. Waltman is a very old name.” A search of U.S. census reports for the name Waltman in the early 19th century reveals many people by that name, including immigrants, who seem not at all related to Conrad and his descendants. The Line of John Emanuel Waldmann. Aside from the work that has been done on Conrad Waltman, one line that is well-studied relates to John Emanuel Waldmann, who was born on June 19, 1715, in Appenhofen, Rheinland-Pfalz, Germany. Details on this family are presented in part because Lora LaMance's book on the Waltmans confused some of the children of Emanuel, as he was known, with chidren of Conraad. George Jacob Waltmann, born on December 12, 1745, in Appenhofen, also arrived in Philadelphia aboard the Crawford with his father and brother in 1768. He apparently went to Loudoun County, Virginia, with his father, and did not go to Bedford County, Pennsylvania, as some have suggested. He died in Loudoun County on October 8, 1823. One research report said he had a son named Emanuel Waltman, who was born in Lovettsville, Loudoun County, in 1775 and died on January 24, 1821. Johan Wilhelm (William) Waldmann was born in Appenhoffen, Germany, on April 7, 1752, and traveled to Philadelphia with his father in 1768. He apparently remained in Philadelphia while his father moved to Loudon County, Virginia. Research by Garry Heagy has produced several entries in Pennsylvania Archives that show him as a private in the German Regiment in the 4th Battalion of the Philadelphia Militia from 1776 through 1784. LDS Church records show that William and Mary Waltman were present at the baptism of four of their children -- William (1774), Nancy (1776), Thomas (1778) and William (a second one, 1781) at Christ Church and St. Peter's in Philadelphia. Other records show these and three other children born in Philadelphia -- George (1783), Samuel P. (1789) and Heinrich (1795). William was described in the 1790 census as a porter living on Water Street in Philadelphia. A citizen list showed him as a porter on Dock Street in 1791. He apparently died in Philadelphia after that date. LaMance appears to have confused this William, son of Emanuel, with a William Waltman who she said was a son of Conrad Waltman. Her book attributed the Revolutionary War records on Emanuel's son William to Conrad's son William. For example, she claimed that Conrad's William served in the 4th Battalion of Northampton County when the war record for William Waltman actually relates to the 4th Battalion of the Philadelphia Militia. There is no evidence that a William Waltman, son of Conrad, lived in Philadelphia. Indeed, Garry Heagy says that genealogical records appear to show only one William Waltman in the area in this era, the son of Emanuel, which raises the question of whether Conrad actually had a child named William. Another William might have existed, but there is no record of it except for LaMance's claims. See the text on William Waltman in the chapter on Conrad's children. George Michael Waldman was born on April 20, 1758, in Appenhoffen. He apparently traveled on the Crawford to Philadelphia with his family but is not included on the passenger list because he was only 10 in 1768. He was known as "Michael Waldman." According to research by Garry Heagy, he died on July 1, 1811, in Locust Ward, Philadelphia. He was married to Anna Eve Esling, who was born about 1760. After Michael's death, census records continued to show her in Locust Ward through 1840. Military records show that Nicholas Esling, brother of Eve, and Michael Waldman served together in the Philadelphia Militia, 2d Battalion, in 1784. The 1783 tax record showed that Michael and William Waltman lived near each other in the south part of Dock Ward in Philadelphia, suggesting a family (brotherly) relationship. In the 1785 citizen list, William is a porter and Michael is a drayman. It is also notable that one of the sons of Michael was named Emanuel, presumably named after Michael's father and indicating the family relationship. Church records indicated that Michael and Eve had ten children -- George (1783), Joseph (1784), Thomas (1784, a twin), Emanuel (1786), William (1788), Maria Ann (1791), Margaretha Ann (1793), Samuel (1795), Catharine Ann (1797), and Samuel V. Waltman (1800). Just as with William Waltman, LaMance confused this Michael Waltman with a Michael who was a son of Conrad. That Michael lived in Maryland and was buried in Frederick County, but did not live in Philadelphia, as LaMance claimed. While there is mystery whether there were two William Waltmans, there is no mystery about Michael: The records show two Michaels. Johann George Waldman, known as George, was born about 1763 in Appenhoffen and traveled with his family to Philadelphia in 1768, when he was five. His wife was named Margaretha, and they moved to Colerain Township, Bedford County, Pennsylvania, around 1790. (A research report in the DAR Library in Washington said that Lora LaMance erred in considering this family as a branch of the Count Conrad family.) Both George and his wife died in Bedford County after 1830. They had at least seven children, all born in Bedford County: Jacob (1791), Margaretha Eve (1793), William (1794), Elisabeth (1795), Maria Anna (1797), George (1799), and Michael Waldman (1803). It was reported that, for many years, this family constituted the only Waltmans in Bedford County. George's daughter Elisabeth married Adam Henry Exline, who had been born in Loudoun County, Virginia, in 1787. 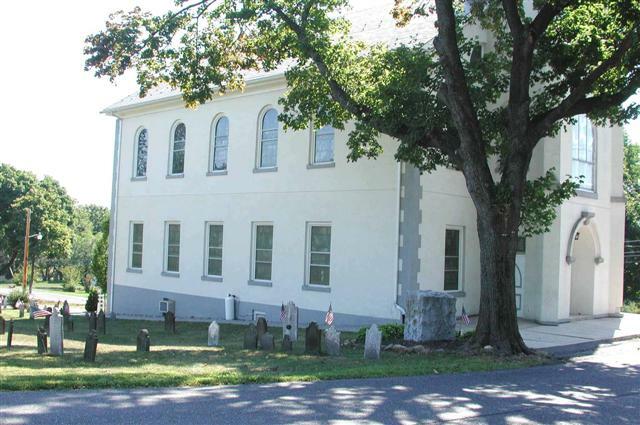 An Exline Family History showed that in 1792, Adam's parents, like Elisabeth's parents, moved from Loudoun County to Bedford County, Pennsylvania. Adam was then five. In 1812, he married Elisabeth Waltman. In June of 1837, Adam and Elisabeth, and their oldest daughter, Margaret, and her husband George Speaker, moved to Lower Sandusky, Ohio. Later they moved to western Ohio, and Adam and Elisabeth reportedly were buried in Van Wert County, Ohio, near the Indiana border. One unsettled issue relates to a Peter Waltman who is shown in records as being born in Bedford County in 1806. According to LaMance and others, Peter married Mary (Polly) Wilson, moved to Mansfield, in northern Ohio, and died there in 1836 as the result of an accident, possibly involving a building. He left a two-year-old son, Emmett Wilson Waltman. Peter's wife Polly died only two years later, in 1838. Researchers indicate that Peter's father was named George Waltman, but there are two possibilities for this identification. One is that Peter was one of the children of the George Waltman in this section and a grandson of Emanuel. Evidence for this is that the Exline History indicated that George's family represented the only Waltmans in Bedford County at this time, and Peter's birthdate (1806) is not far removed from the birthdate (1803) of the last-known child, Michael, in this family. The other possibility, put forward by several researchers, is that Peter was the son of the George Waltman who, according to LaMance, was a child of Conrad's son William Waltman. That George was reported by LaMance to have married his cousin, Eleanora Lutz, another descendant of Conrad, but neither the existence of Eleanora nor the marriage between her and a George Waltman has been proven. The issue needs further research..
Samuel Waltman (George Friderich Sam. Waltmann) was born about 1761 and died after 1806. His wife was Elizabeth and they lived in Loudoun County, Virginia, where they leased land formerly occupied by his father, Emanuel. His son David Waltman joined his father in leasing the land. * Johann David Waldman was born in 1748 and died in 1749. * Johan. Nicolaus Waldman was born in 1749 and died in 1751. * Marianna Waldman was born in 1755. * Johann Michael Waltman was born and died in 1763. The Furstenberg name was used mainly by the Catholics of the family, while the Protestant members called themselves Frundsberg. Reportedly, there was also discord between the two family groups. According to LaMance, two brothers, Egon and William Furstenberg, were both bishops of the Catholic Church and allies of Louis XIV of France, who was constantly seeking new territory. In an act said to be regarded as treason by the Protestants of the family, the two bishops in 1681 turned over to France the keys to the city of Strassburg, the Protestant capital of Alsace (which adjoined Bavaria). Although various accounts of the family used the names Furstenberg and Frundsberg interchangeably, in time virtually all people of both names disappeared. LaMance said this was partly because the family was not prolific, partly because they tended to get involved in wars, and partly because many of them married commoners, which meant that offspring of the marriages were not regarded as legitimate heirs. By the end of the Thirty Years War, in 1648, according to LaMance, virtually the entire line of the Protestant Frundsbergs had died out. The only known exception was Count Hiram von Frundsberg, then probably only 10 years old. Although Catholicism became the state religion of Bavaria after the war, the large Frundsberg estate there was regarded as a Protestant settlement and refuge. In 1652, the boy's guardian secured for him a large and elaborate Bible published in Wittenberg, said to symbolize Hiram's leadership of the Lutheran church in the area. In her 1928 book, LaMance said she was in possession of that Bible. In early 2006, the Bible was reported to be in a display case in the library of the University of North Carolina in Chapel Hill, placed there by a descendant of LaMance. The Child is Called Valentine. Count Hiram apparently married early, to a woman named Margaret, but they were childless, and the Frundsberg line appeared doomed. The LaMance story is that every Saint Valentine's Day, Count Hiram went hunting wild boar in the Black Forest with friends. On February 14, 1681, as they were returning from the hunt, they came upon a little boy, not quite three years old, in the middle of the road. Judging by the velvet and lace dress of the child, it appeared that this was the child of a noble. Hiram took the boy to his home and decided to raise him as his son. Hiram was 43. LaMance said that Hiram immediately realized the identity of the boy. Spain at that time possessed Alsace, a wealthy Protestant area about the size of Connecticut, with Strassburg as its capital. Louis XIV wanted possession of Alsace, but Spain was resisting. Spain had sent a certain Count Pedro to watch over the territory, and Pedro was succeeding. (Several researchers have said they believe Pedro’s last name was “Ferrette.”)  Because Pedro was "in the way" of Louis XIV, LaMance said that he "met with foul play." But also in danger was Pedro's son, who had been born on April 9, 1678. In 1685, four years after Valentine was adopted, Hiram and his wife, both probably about 47 and childless for 25 years, had a baby girl; they named her Barbara, after a famous Frundsberg ancestor. In time, according to LaMance, Valentine fell in love with Barbara von Frundsberg. In 1710, when Valentine was 32 and Barbara 25, they married, and Count Hiram had to prove to local officials that they were not blood relatives. Conrad is Born. LaMance said that five years later, in 1715, Valentine and Barbara had a son, Conrad Waltman, born in Bavaria. She said that Conrad had an older brother, Peter, who was the legitimate heir, but Peter was crippled and died relatively young. However, Byron Waltman said there was no documentation for this. Little else is known about Valentine. LaMance said that he died in 1750, at the age of 72, on his wife's estate in Bavaria. She said Barbara died in 1762, at the age of 77. NOTE: There is no document that says that Conrad Waltman was born in 1715, only the claim of LaMance that this story is correct. She also said she believed his wife, Katherine Bierly Waltman, was born in 1718 (and not in 1708, as written on her tombstone)  and that Conrad was three years older. In the absence of other evidence, this paper assumes that Conrad’s birth date was 1715. However, other researchers believe that Katherine’s tombstone is correct, that she was born in 1708, and that Conrad, if three years older, may have been born in 1705. The question about the dates of birth of Conrad and Katherine is considered further in discussion of the date of birth of their son Valentine Waltman, who may have been born as early as 1733. LaMance also claimed that Conrad lived until 1796 and died at the age of 81, but there is no evidence relating to his death or burial. The LaMance story is that, like many of his Frundsberg ancestors, Conrad fell in love with a commoner, Katherine Bierly, born in 1718 in Bavaria. LaMance said their marriage would have been illegal in Germany, due to the rule of eben burtig, or equal birth. “Royalty could not marry nobility, and nobility could not marry commoners. The Bierlys were commoners.”  Both Katherine’s parents, who were very religious, and Conrad’s parents strongly opposed a marriage. Frustrated by this opposition, in 1738, when she was 20, Katherine and a maid fled to Holland. (Five of her siblings had already sailed to America.) Conrad met Katherine there shortly afterward, and they were married, according to LaMance. Refusing the urgent pleas of his parents to return to Bavaria, LaMance wrote, Conrad took Katherine to Amsterdam, and in July of 1738 they sailed aboard the vessel Davy, commanded by William Patton. On the 25th of October, 1738, they arrived in Philadelphia, and in time traveled northward to the eastern portion of Pennsylvania near what today is Allentown. Conrad signed the list of passengers with an “X” (his mark). LaMance wrote that, after their arrival in America, “now Katherine was a legal wife. None too soon, for late in the year she gave birth to twins.” The twins, Katherine and Margaret, were born on Christmas Day, 1738. The year 1738, when Conrad Waltman sailed, has been reported as a devastating year for trans-Atlantic travel. Large numbers of Germans, especially from the Palatine, converged on Holland anticipating ship transportation to America. They were kept in holding areas for long periods of time, and many became ill before being sent on to England. Often they were transferred to other ships for the passage across the Atlantic. A newsletter entitled Beyond Germanna  has provided some of the “horror stories of sufferings and death” aboard these ships. Most reports of the arrival of the Davy in Philadelphia identified William Patton as the captain, but if the report above is correct, Patton was actually the ship’s carpenter and was only captain by default after the real captain perished. There are differing reports on how many people were on board the Davy. The report here said a total of 121 – 74 men and 47 women. The classic book on Pennsylvania German Pioneers, by Strassburger and Hinke, provided lists of the names of immigrants into Philadelphia. It said there were 141 passengers on the Davy, including 94 men and 47 women. Another report listed 95 people on the Davy, all men. Still another said there were 180 passengers, but it provided a list of only 40 names. If the account above is correct, these 40 might have been the ones who were well enough to go to the courthouse to take the oath of allegiance. Of these, one was “Conrad Waldman,” and he was one of 18 who signed with an “X” and had their names written by a clerk. Where was Katherine? LaMance contended that Conrad Waltman’s wife, Katherine Bierly Waltman, journeyed to America with him aboard the Davy. But did she? There is no Katherine on any list of the Davy’s passengers. There are only men. The ProGenealogists explanation of its inclusion of the names of some women and children, and the non-listing of others, is that its lists began with the Strassburger and Hinke lists of males over 16 and then added women and children to them, but only to the extent that accepted research by other genealogists had verified that those women and children had been aboard. No official record exists of all the passengers on the ships, and ProGenealogists has said its list, at best, would be only be partial in regard to women and children and most likely never complete. Thus far, there is no proof that Katherine Bierly Waltman was on the ship, or that she wasn’t. LaMance reported  that in the period 1725-32, four Bavarian brothers and a sister – all named Bierly – traveled to America. She said they left behind another sister, Katherine Bierly, the one who married Conrad Waltman. The LaMance account that Conrad and Katherine traveled together may be correct, but it may also be possible that Katherine went to America with her brothers and met Conrad Waltman there. Perhaps later research will confirm that Katherine was on the Davy with Conrad. Perhaps it may also address the suggestion (in the next chapter) that Valentine Waltman, a son of Conrad and Katherine, was born a number of years before the 1738 sailing of the Davy, and the possibility that he may have traveled to America as a child. Currently, there is no record of Valentine either traveling to America or being born in America. Various records also suggest that the family stayed in different communities, including at least one in Bucks County, possibly before reaching the Kreidersville area, as they journeyed north from Philadelphia, their port of entry, or on a temporary basis after reaching the Kreidersville area. There is evidence that they lived in Bucks County in the area around Bedminster, east of Quakertown, during the period 1745-1760. This comes from the baptism record of their daughter Anna Barbara in 1745, the marriage of their daughter Elizabeth in 1758, and the baptism of two sons of Elizabeth in 1759 and 1760. Their son Valentine reportedly married Catherine Brücker in 1755, in this same time period, and it also could have occurred in the Bucks County area. One factor in this is that Catherine Brücker's parents were sponsors on October 14, 1759, for the baptism of a Susanna Konig, suggesting that the Brückers also lived in this area. If Valentine Waltman married Catherine Brücker in 1755, as has been recorded, it is possible that the marriage took place during this period when both Waltmans and Brückers lived in Bucks County. However, Bucks County may not have been their permanent home. It has been reported by genealogist Hannah Roach that many people from Northampton County temporarily moved south to Bucks County during this time to avoid troubles with Indians. When Jacob Brücker died in 1761, his estate was handled in Northampton County courts. Both the Waltman and Brücker families may have been regular residents of Northampton County residing in Bucks County only on a temporary basis. Certainly in later years, church records indicated that several of Conrad Waltman’s family members (but not Conrad!) were regular in their attendance at communion services at the Zion Church. Work for a new church building began about 1771, when additional land was purchased. The idea was to consolidate three small churches in the area, since it had proved difficult for them separately to obtain a pastor. One of the earlier churches was in Howersville or Indian Creek. It was also known as Dreisbach Church, since it was started by Simon Dreisbach, Sr., about 1747. The other two were at nearby Indian Land, and at Emmanuelsville in Moore Township. In 1772, a building committee that included Valentine Waltman, a son of Conrad, was named and charged with construction of a Union Church to serve Lutheran and Reformed citizens of Lehigh, Allen and Moore townships, including education of children “in the German Tongue.” The deed of December 7, 1770, showed that Peter Friedt, a “yeoman” (farmer who owned his land) of Allen Township, sold the land for three pounds. A church history said the church land adjoined property owned by Valentine Waltman (also described as a yeoman) on the north side. The church property was in Allen Township, bounded on the north by the border between Allen and Lehigh Townships and land of Valentine Waldman (which was in Lehigh Township), on the west by the King’s Highway and land of Conrad Kreider, and on the south and east by land of Peter Friedt. * Although there is a Conrad Waltman in a list of privates in the Revolutionary War in 1776, most genealogists (other than LaMance) believe that that Conrad was not the immigrant who arrived in 1738 and who would have been 61, but a younger Conrad Waltman, then 17. Zion Stone Church in Kreidersville in a rural area of Northampton County. 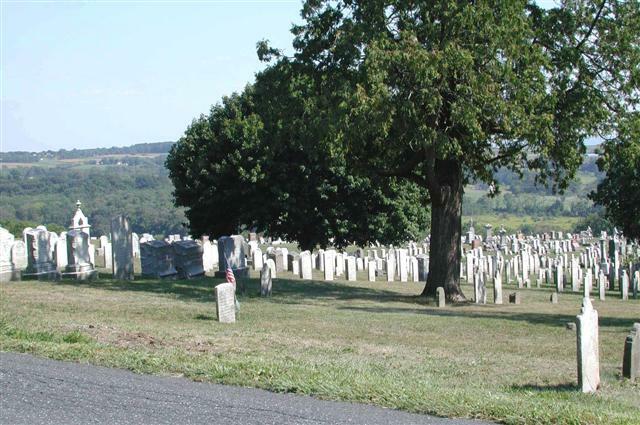 The cemetery is seen looking south toward the town of Northampton. The photo was taken from land apparently owned by Conrad's son Valentine Waltman at one time. The picture at the right shows the DAR marker honoring people who participated in the War and were buried in this cemetery. It does not mention Conrad Waltman. * There is no will and no land transfer record mentioning Conrad. * A search by DAR staff in its Washington library concluded there was no Conrad Waltman in the 1772 Proprietary Tax List, when Conrad would have been 57 (if born in 1715). The other Conrad would have been only 13 in 1772 and not required to pay taxes in that year. * Conrad did not appear in the published tax lists of 1785, 1786 and 1787 in Northampton County,  as determined by the DAR staff. Genealogist Hannah Roach found evidence of Valentine, Peter and other Waltmans on the tax lists of Lehigh Township in Northampton County from 1761 through 1788, a stretch of 27 years, but no Conrad. * Conrad did not appear in the list of takers of the 1777 Oath of Allegiance, although the law required that all white male inhabitants above the age of 18 had to sign. The second Conrad Waltman, born in 1759, would have been close to the age required for signing the oath, but there is no Conrad Waltman at all on the list. * The 1790 census, the first one undertaken by the U.S. Government,  revealed that in Allen Township, there were only two heads of household named Waltman, and they did not include Conrad. They were Valentine, a son of Conrad, and Andrew, who apparently was a son of Valentine and not a son of Conrad. Another son of Conrad, Peter, was shown in nearby Lehigh Township. Each of the three households contained only one male over 16, which indicated that Conrad was not living with one of these men. LaMance believed that Conrad died in 1796 at the age of 81 at the home of Andrew Waltman, whom she believed to be his son and with whom she said he resided. For the last years of his life, LaMance said, Conrad was a "great care" to his children, since he was "completely out of his mind." She said Conrad was "worse than a child" and complained that the demented man tore the fly leaves from the massive family Bible, thereby obliterating the last name of his real grandfather, Count Pedro of Spain. Further, he lost all of his money. But there is no evidence of this. Despite LaMance’s creation of a book based on stories of this man and his descendants, it is a mystery why the immigrant Conrad Waltman does not appear in official records in the area where she said he lived. If he went insane and was cared for by his children and grandchildren near the end of his life, there nevertheless should have been some record of his existence – in tax files, church attendance, land transactions, and even the 1790 census. A possible answer for the lack of evidence of Conrad's life is that he was long since dead! Even if it were true, as LaMance thought, that Andrew Waltman was the last-born child of Conrad, and that Andrew was born in 1760 (and there is evidence that Andrew Waltman was not a son of Conrad), 1760 would be the last date on which there is any suggestion that Conrad was still alive. Certainly, there is no documented evidence of Conrad's existence after that date. Perhaps LaMance's story about Conrad's visitors from Valley Forge 16 years later, in 1776, was just the product of her imagination. Conrad’s wife, Katherine Bierly Waltman, died at the age of 68, ten years before LaMance's date of death for Conrad. Her tombstone gives her date of death as March 25, 1786. She was buried in the cemetery at Zion Church in Kreidersville. 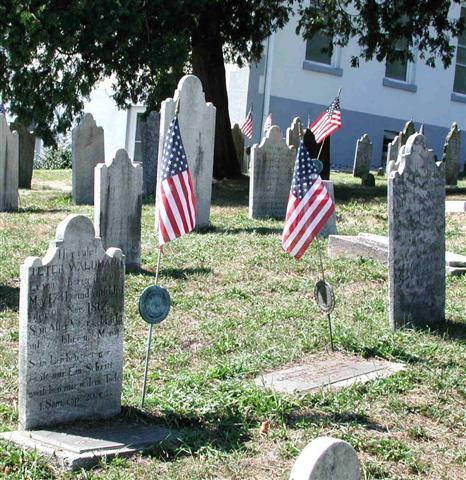 Her tombstone is near the front door of the church, the second or third stone away from the large DAR plaque that honors Revolutionary War soldiers. A monument at the back of the church says that the current structure dates from 1838, and thus it was not in existence when Katherine and Conrad died. 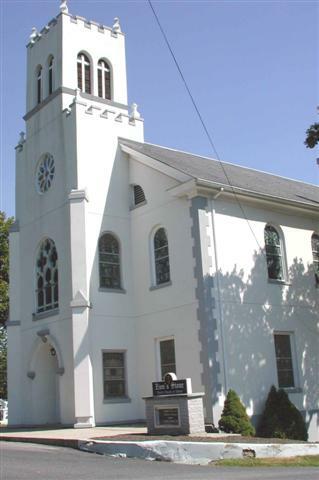 The congregation, however, has a longer history, dating from 1745, when the Howersville congregation was begun. Later, two nearby smaller churches were incorporated with the Howersville group to form the Kreidersville church. Katherine’s tombstone, outlined in LaMance’s book on page 44, is shown below. 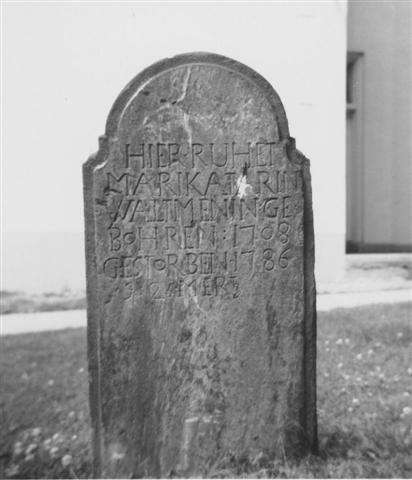 In translation, it says “Here rests Maria Katarina Waltman, born 1708, died 1786, March 25.” Hannah Roach’s research also provided the identical text. See the stone above. LaMance said the stone incorrectly gave the date of Katherine’s birth as 1708 rather than 1718, but some believe 1708 was correct and that Conrad, three years older, was born in 1705. A list of communicants at Christ Lutheran Church in Schoenersville, near where Valentine Waltman lived, on November 24, 1782, included “Catherine Waltman, Jr.” and “Catherine Waltman, Sr.” It is not clear who these Catherine Waltmans were, since Conrad Senior, Conrad Junior and Valentine were all married to a “Catherine.” Nevertheless, if the “senior” Catherine was the wife of Conrad Senior, this would be virtually the only public mention of the wife of the immigrant Conrad aside from her tombstone. She was no more evident in the genealogical records than her husband. * First is the question of whether the “Conrad Waltman” who is recorded as serving as a private in the Revolutionary War was the immigrant Conrad Waltman (1715-1796) or a later Conrad Waltman (1759-1785). * Second is whether the younger Conrad Waltman (referred to here as Conrad Junior) was a son of the first one. Some believe he was. Some believe he was a son of Valentine Waltman, who was a child of the first Conrad Waltman (Conrad Senior), and that therefore Conrad Junior was a grandson of the first Conrad. LaMance believed the second Conrad Waltman did not exist at all. * Third is the question of when Valentine Waltman was born, and where. LaMance said he was born in 1742 in America, but genealogist Hannah Roach thought he must have been born before 1733, although this is before the immigrant Conrad Waltman traveled to America in 1738. * Fourth is whether Peter Waltman (1779-1836) was the son of Valentine Waltman or of Conrad Waltman, Junior. Conrad Waltman Junior (1759-1785) definitely existed. Peter Waltman (1779-1836) definitely was the son of Conrad Waltman Junior. Conrad Waltman Junior probably was the son of Valentine Waltman. Conrad Waltman Junior (1759-1785) most likely was the “Conrad Waltman” who was in the Revolutionary Army, and not Conrad Waltman Senior (1715-1796). Valentine Waltman’s birthdate and birthplace remain a mystery, although he clearly lived in the Schoenersville area, north of Allentown, southeast of Kreidersville. The whereabouts of Conrad Waltman Senior (1715-1796) during his lifetime remain a mystery. LaMance is the only person to claim evidence of his life, and all of that seems to be hearsay. There was only one “Conrad Waltman” in the records of the Revolutionary War, and it is not clear if it was the immigrant Conrad (1715-1796?) or his grandson Conrad (1759-1786). In the Pennsylvania Archives, a muster roll of “Captain Rundio’s Company, Northampton County, Flying Camp, 1776,” in the War of the Revolution,  showed 43 privates and three officers. “Conrad Waltman” was one of the privates. It is clear that the company was involved in the infamous Battle of Fort Washington on November 16, 1776, but it is not clear whether Conrad Waltman was then with the company, or which of the two Conrad Waltmans it was. The senior Conrad Waltman would have been 61 in 1776. Some believe that at this age Conrad was too old for military service, and under the existing rules his service would not have been required. Some who think otherwise argue that it was logical that a patriotic man aged 61 could have offered his services to help the Revolution and that, lacking military experience, he probably would have been given only the rank of private. The rule was that all fit men between 16 and 50 were required to join the militia, but the oldest in most of the companies was in his mid-30s. As best can be determined, the privates in Captain Rundio’s company were quite young, many in their teens. Peter Rundio (1738-1817) himself was 38, and his first lieutenant, Robert Brown (1744-1823), was 32. It was not until September 10, 1776, that the Standing Committee for the militia for Northampton County met at Easton to make major decisions regarding the company. The minutes  reported that Peter Rundio was appointed captain in the room of John Hays, “who declines going into service on account of the present troubles in his family having lately lost his Daughter, as by Colo. Dreisbach’s Letter to this Committee appears.” Robert Brown was appointed first lieutenant to Captain Rundio, Andrew Boyd (who did not appear in the later muster roll) was appointed second lieutenant, and John McDowell, Junior, was appointed ensign. A history of Northampton County, published in 1877, said that the county was assigned a quota of 346 men for the militia,  and that Captain Rundio’s company of Flying Camp volunteers fought in the battles of Long Island and Fort Washington in 1776. (The Long Island battle actually occurred in August, before Rundio became captain.) The big event at Fort Washington, on the northern tip of Manhattan Island, was described by historians as perhaps the biggest disaster of the war, and it seems clear that Rundio’s company was there. It took place on November 16, 1776. November 15th, 1776. General Howe sent a flag demanding a surrender of Fort Washington, or all to be put to the sword – an answer to be returned in two hours. Colonel McGaw, commanding on the Island, having called the Field Officers together, a Council was held, and it was unanimously agreed to return for answer that we were determined to hold the Fort to the last extremity, and to rely on General Howe’s usual clemency in being put to the sword. November 16th. An attack having began early in the morning, continued until about 3 o’clock in the afternoon, whom the Hessians, being in possession of the hill on the north, the British, Scotch, and Hessians on the east and south, General Howe sent a second flag, with the following summons. The Commander-in-Chief demands an immediate and categorical answer to his second summons of Fort Washington. The garrison must immediately surrender prisoners of war, and give up all their arms, ammunitions, and stores, of every kind, and send two Field officers to these quarters, as hostages. In so doing, the General is pleased to allow the garrison to keep possession of their baggage, and the officers to have their swords. William Paul Deary, a scholar of the military at that time,  provided a similar version of what occurred that day. He wrote that in early November 1776, it was clear that the British, having taken lower Manhattan, were going to try to complete the capture of the island, then known as York Island. They would then advance into New Jersey from the northern tip of the island, near Mount Washington. On November 12, American reinforcements were sent forward from Fort Lee, across the river in New Jersey, including 840 from the Pennsylvania Flying Camp. The effect was to increase the Mount Washington garrison by half, to a little over 3,000 men by the morning of November 16. The British and Hessians were coming in superior numbers, about four to one, but General Washington and his colleagues, meeting on boats in the middle of the Hudson River on the night of November 15, decided to hold their positions and not withdraw their troops. By the morning of November 16, the garrison on Mount Washington, led by Colonel Robert Magaw, consisted of about 1,300 continental regulars, 1,100 from the Pennsylvania Flying Camp militia, and about 600 state troops from Pennsylvania and Connecticut. The Flying Camp group included full regiments led by officers Baxter and Swope, and it appears that the Baxter contingent included Captain Rundio’s company. By 1 p.m. on November 16, Deary wrote, after five British attacks on Mount Washington on three fronts, nearly all of Magaw’s garrison had been driven into Fort Washington itself or its perimeter. Surrender talks began before 2 p.m., ended at 3 p.m., and at 4 p.m. the garrison marched out and laid down its arms. In the fighting, only 54 Americans had been killed and 100 wounded. British General Howe later reported that 2,837 prisoners were taken, of whom 230 were officers. General Washington and three other generals actually had been on York Island in the morning, but they left in time to avoid becoming casualties themselves. Deary wrote that the name “Battle of Fort Washington” is “misleading, since the small earthwork pentagon that overlooked the Hudson River atop Mount Washington served no purpose except to provide temporary and illusory shelter for the American defenders.” He said the battle was “commonly regarded as the worst defeat for American arms during the eight-year war for independence.”  The British moved on. If the Mount Washington garrison had been evacuated in advance, the three thousand men there would have been able to join Washington’s army in New Jersey. Deary said that “Generals George Washington and Nathanael Greene have long been regarded as the American parties most responsible for the debacle on upper York Island.” However, the battle never received the attention it deserved because the Americans recouped with victories at Trenton on December 26 and Princeton on January 2, and Fort Washington was largely overlooked by historians. However, other accounts indicate that a number of the soldiers were paroled. Deary said that most of the officers taken in battle, if not seriously ill or gravely wounded when captured, were put under loose house arrest, at first in New York City and later on western Long Island, and most survived until they were paroled or exchanged. There is much information about the battle on the internet. For a sampling, search on "Battle of Fort Washington." On Board of ye ship Judith, Decem’r 10, 1777. It is not clear how many men were covered by this document, or who they were. The certificate held by Mrs. Brown did not show the names that Lieutenant Brown said were “hereunder written.” Nor is it clear if the men had to remain aboard the ship or could walk about freely. An applicant to the DAR in 1918 wrote that Lieutenant Brown had been able to pursue his previous trade as a blacksmith and thus was able to earn money to provide food and other necessities for his men. A profile of Robert Brown, who was later promoted to general, written for the 1877 Northampton County book, described the event this way: Brown had been captured at the surrender of Fort Washington on November 16, 1776. He and his companions had fought for 48 hours without food or water, and when their ammunition was gone, they surrendered. Along with 2,000 others, they were held in a church in New York, where two or three hundred died. Although he was let out on parole, Brown was not released until January 25, 1781 – more than four years after the battle -- when he returned to Northampton County. Later he was a prominent citizen, elected to the Fifth United States Congress from Northampton County and reelected seven times, serving from 1798 to 1815. John Christian, December 25th; Jacob Moritz, 28th; John Diffenderfer, 29th; Benjamin Swartwood, 3d of January, 1777; Ned Lafferty, 4th do [ditto]; John Dull, 4th do; Pharo McGee, 9th do., Jacob Warner, 9th do. ; John Handelong, 11th do. ; Isaac Shimer, 14th do. The signing of the list is curious. Ensign McDowell seems to have signed it on December 30, 1776, which would have been the day before the term of service for the Flying Camp expired, but the deaths covered by the list continue up to January 14. Andrew Boyd, who “endorsed” the list, was the man appointed Second Lieutentant in Captain Rundio’s Company at the meeting of the Standing Committee in Easton on September 10, 1776, but his name did not appear on either list of Rundio’s company. If these lists are correctly interpreted, within eight weeks of the fall of Fort Washington, nine or ten of the 46 men in Rundio’s company had died – nearly 25 per cent! – apparently either from wounds of the battle or from illness or malnourishment. However, there is evidence that some of these suggestions of deaths in the Pennsylvania Archives were not correct. At least three of the ten who were reported to have died were still living in the 1800s. * John Dull, a private, is recorded, as noted above, as having died on January 4, 1777. However, the on-line card file of the Pennsylvania State Archives shows that he was still alive in 1781, when he did another tour of military duty. Contributors to the OneWorldTree program of Ancestry.com said he was born in 1753 and died in 1835, not in 1777. He would have been 23 when the war began. There are 37 members of the DAR who trace their lineage to John Dull, far more than those who claimed Conrad Waltman as a patriot ancestor. * Colonel Baxter, who supposedly had charge of Rundio’s company at Fort Washington, was reported by Heitman to have been killed in the battle on November 16, 1776. * Lieutenant Brown, as noted above, was not released for four years. * Ensign McDowell, who signed the list of the deceased quoted above, apparently was promoted after being appointed to Captain Rundio’s company. Heitman identified him as captain of Montgomery’s battalion of the Flying Camp, July to December 1776, and Lieutenant Colonel in the Pennsylvania Militia, 1777-78. It appears he was not captured. * Captain Peter Rundio was back at home taking the oath of allegiance in Northampton County on August 8, 1777, nine months after the surrender of Fort Washington, which suggests he was not taken prisoner and perhaps did not even participate in the battle. Peter Rundio apparently got the job by default, as noted above, when at age 38, he was appointed captain as a replacement for John Hays. In 1781, four years after Peter Rundio came home to take the oath, there was a Peter Rundio recorded as a member of the Northampton County militia, not as a captain but as a drummer. One family researcher believes that this was not the Captain Peter Rundio who took the oath in 1777, but rather his son, also named Peter. It was understood that boys would use drums to call the soldiers to order. Was Conrad Waltman Involved? No one is known to have claimed that Conrad Waltman was taken prisoner, but if he was present, he may well have been captured, given the reports of the events of November 16. However, one can speculate that Conrad, if he was captured, may have escaped or been released before Lieutenant Brown was released. If it was the elder Conrad who was involved, it is possible that he was simply enrolled in the battalion and then sent home because of his mental disability, as LaMance claimed, without having participated in any battles. If Conrad Junior was the man mentioned in the Pennsylvania Archives, it is clear that he was back in Northampton County shortly after the battle, at least by the time his son Peter was conceived in May of 1778, six months later, and by the time he was married on September 15, 1778. Indication that the soldiers in the Flying Camp may have been younger (and therefore that this was the younger Conrad) comes from the testimony of a Frederick Nagel, of Allen Township, who was only 15 in 1776. Although his name does not appear with Captain Rundio’s company, Nagle clearly came from the same area as the other recruits. Nagle testified in court in 1837, 61 years later, in quest of a pension relating to his service. He said that at that time he came from Allen Township, that in June 1776 he had become a volunteer in the Flying Camp, enlisting in Lehigh Township under Jost Dreisbach. He had marched into Moore Township and joined the company commanded by Captain Nicholas Kern. They in turn joined with other companies in Easton, under the command of Colonel Peter Kichline, and then went to New York. On August 26, Nagle said, his group joined still other forces and went to Long Island in boats. The next morning, the battle commenced, he said, and the British came so hard that the colonel ordered a retreat. Nagle said he was taken prisoner, along with about 700 others, and they were kept in churches and fed on only green apples. About the first of October 1776, they were put on a British ship, the Julianna, and at the end of October, they were offered a release if they would swear that they would not take arms again, but Nagle and several others refused. They were then taken to Halifax, where they remained for more than two years. He was discharged after being released and reaching Windsor. The story of this Flying Camp battalion is similar to that of Captain Rundio’s company, but the event that Nagle described was earlier, on August 26, and the one attributed to Lieutenant Brown was on November 16, 1776. The ship names also differed, although they were similar: Julianna for Nagle in August, and Judith for Brown in November. Which "Conrad Waltman" was in the Flying Camp? LaMance was clear she thought it was Conrad Senior who was in the war. She wrote that at that time Conrad’s brain was troubled because of his family difficulties, and that melancholia gripped him. However, she said, “old as he was, in July, 1776, when he was 61, he joined the Flying Squadron to repulse the British in New Jersey and Long Island. . . . But it was soon evident that there were too many ‘wheels’ in his head for a soldier, so he was dismissed and sent home.” She concluded that “the old Count not only joined the army himself, but all eight of his sons served in the Revolutionary War, three sons-in-law, and sixteen grandsons. We doubt if there is another American family that has a record that equals it.” While there may be doubt about Conrad, it appears to be correct that, at least, eight people, possibly all sons of Conrad, served in the military during the war. Family descendants who accepted these conclusions placed in the Zion Church Cemetery in Kreidersville, about 1986, a metal marker honoring the senior Conrad Waltman (1715-1796). Immediately next to the marker for Conrad is a German-language tombstone and an English-language metal marker for “Peter Waldmann.” This is the John Peter Waltman, known as “Peter,” who was a son of Conrad Senior. Conrad would have been 26 when Peter was born. The markers for Conrad and Peter are about 20 yards beyond the southeast corner of the church, and in 2007 each had a bronze marker and an American flag. Near the rear of Zion Stone Church are the tombstone and bronze marker for Peter Waldmann (front left), and the controversial marker for Conrad Waltman (also at right). Both have flags. To the right of the marker for Conrad is the tombstone for Peter's wife, Maria Elizabeth Boyer Waldmann. The relatively recent marker for Conrad was placed between the much older tombstones of Peter and his wife. In any event, the marker that honors Conrad is simply a memorial of honor and not a tombstone or a place of burial. Genealogists with the Daughters of the American Revolution said that a study of the men and women buried in the cemetery of the Zion Church in Kreidersville, first copied in 1937 and then revised in 1943, did not mention a Conrad Waltman. The same is true of the church’s own list of burials, compiled in 1940. Although some observers believed that the plaques honoring Conrad and John Peter were placed there by DAR staff, one of the people responsible for installing them, William Fiedler,  said that the plaques were requested of the Federal government through the military affairs office of Northampton County. Fiedler and others presented documentation to certify the participation of Conrad Waltman in the Revolution, and the county forwarded this to Washington and obtained the plaques. DAR staff said that, since about 1985, the DAR has required verification of information placed on its cemetery markers. The plaque in honor of Conrad had not been verified with the DAR, and the DAR said it would not verify it in 2006 without further proof of Conrad’s service. In any event, the marker is not a DAR plaque. It is understood that the documentation submitted to the Northampton County office to justify issuance of the bronze plaque consisted, in part, of submission of the Pennsylvania Archives listing of a “Conrad Waltman” as a private in the war. Also submitted was a copy of a letter of May 4, 1928, from the Archivist of the Pennsylvania State Library and Museum, certifying that the name of “Conrad Waltman appears as a Private on a Muster Roll of Captain Rundio’s (Rundis) Company of Northampton County Militia, Flying Camp, 1776, in the War of the Revolution,” and citing the pages in Pennsylvania Archives where the name appeared. Although those who believe this letter certified that Conrad Senior was the one who was in the War, in fact the letter said only that a person by the name of Conrad Waltman was on the roll, and thus it left open to interpretation which of the two Conrads was the one on that list. Also noteworthy is a large plaque placed in front of the Zion Church in 1931 by the Commonwealth of Pennsylvania and the Liberty Bell Chapter of the DAR. It says: “This tablet is in commemoration of the services of Revolutionary War Soldiers buried in Zion’s Stone Church Cemetery, Kreidersville, PA. This marker is dedicated in grateful recognition of their patriotism, valor and fidelity.” The tablet contains 60 names, one of which is “Peter Waldman, May 9, 1741 – Nov. 9, 1817.” This is the only Waldman/Waltman on the plaque. There is no Conrad, which suggests either that the compilers of the list did not believe Conrad served in the War or that he is not buried in that cemetery, or both. Conrad, Jr., was a Revolutionary War soldier, viz., Penna. Archives, Fifth Series, Vol. III, p. 537, and Vol. XXIII, p. 455. Issue 2 sons and 2 daughters. Further, Wilkins wrote in 1950, it was wrong for LaMance to say that “the old Count not only joined the army himself,” since it was Conrad Junior who had been mentioned in the Pennsylvania Archives and not Conrad Senior. Wilkins’ page of corrections was pasted inside the copy of the LaMance book in the DAR library in Washington – possibly by Wilkins herself – and it was still there in 2006. The page was also included in the library’s Conrad Waltman patriot file. The record on Conrad Waltman Senior at the DAR Library in 2006 said, in one computer file, “Patriot Deleted.” A newly established computer file on Conrad Senior was then marked “FAMPCS” – Future Applicants Must Prove Correct Service. What this meant was that, although, as of March 2006, the DAR had approved the membership of 17 individuals who based their applications on the presumed participation of Conrad Waltman Senior in the Revolutionary War, it would accept no more unless it was proven that Conrad Senior actually had participated in the War. Nine of these 17 members (including LaMance) had traced their lineage through Andrew Waltman (believing him, apparently erroneously, to be a son of Conrad) , four through his daughter Margaret, one through his son John Peter, one through his son Hiram Michael, and two through his “son” Conrad Junior (Wilkins and Ware), although it appears that Conrad was not the son of Conrad Senior either. Following the interaction with Margaret Wilkins, the DAR decided to accept applications based on the participation of Conrad Junior in the war, accepting the view that the Pennsylvania Archives was referring to Conrad Junior and not to Conrad Senior. In 2006, there were four DAR members who had based their applications on the patriot status of Conrad Junior, including Margaret Wilkins (after she revised her application) and Dorothy Ware (both through Joseph Waltman, son of Peter Waltman), genealogist Irene Diehl Konrad, of Florida (through Mary Waltman Meyer, a daughter of Peter), and Pamelia Trupiano Bennett Carter, of Michigan (through Rebecca Waltman Hinckle, another daughter of Peter). -- the DAR decision, after considerable research, to allow applicants to base their lineage instead on the military service of Conrad Junior. DAR officials concede that they are not omnipotent and that the information in a DAR file is not necessarily dispositive of the military status of a presumed patriot. Despite this caveat, it must be said that most of the DAR records are very valuable in examining the information developed by others in their genealogical research and in providing clues for further examination. The DAR staff clearly has become stricter as time proceeds in regard to the degree of proof it requires. All of the genealogical issues are open to further debate and proof, but it would not be easy to prove a different result for Conrad Senior. This account continues in the next chapter, with a focus on the children of Conrad Waltman. A third chapter carries forward with Peter Waltman of Allentown and his descendants. Members of the family of Conrad Waltman Senior lived in a variety of places within Northampton County at a time when the structure of the county was in a state of great change. Many of the family members had residence in and were taxed as part of Allen Township, but that township was steadily broken up, and Lehigh County was taken away from Northampton County entirely. Waltman family members in the area often lived not far apart, even though their township affiliations were quite different. This brief outline of the nearby counties and townships is drawn from the website of the Pennsylvania State Archives. * Bucks County and two other counties were created by William Penn’s family in 1682. * Northampton County was created out of Bucks County on March 11, 1752. East Allen Township, east of Allen Township, was created in 1845 out of Allen Township. -- Bath Borough was created in 1856 out of East Allen Township. Northampton Borough was created in 1901 out of Allen Township. North Catasauqua Borough was created in 1908 out of Allen Township. Hanover Township, Northampton County, south of Allen Township, was created in 1798 out of Allen Township. Much of it was given over to Lehigh Valley International Airport. Lehigh Township was created in 1752, but settled in 1732. It lies between the Lehigh River and Walnutport on the west and Moore Township on the east. The southern border of Lehigh Township is Church Road on the north side of Zion Church in Kreidersville, although the church itself, and the village, are in Allen Township. Lehigh, Moore and Allen Townships meet at a point one-half mile east of Zion Church. Valentine Waltman owned property in Lehigh Township just across the line from Zion Church. Moore Township was created in 1765, but settled in 1740-1750. It includes Emanuelsville Church, just north of Petersville, which is about two miles northeast of Zion Church of Kriedersville. * Lehigh County was created out of Northampton County on March 6, 1812. Hanover Township, Lehigh County, was created in 1798 out of Allen Township, Northampton County, but settled in 1745. It borders Catasauqua on the west, North Catasauqua on the north, Hanover Township of Northampton County on the east, and Lehigh Valley International Airport on the south. Schoenersville is part of this township. -- Catasauqua was created in 1853 out of Hanover Township. Lora S. Nichols was born on April 2, 1857, in Wolcottville, Indiana. She wrote in her book that she was descended through Conrad Waltman (1715-1796), his son Andrew Waltman (1760-1796), his son Valentine Waltman (1790-1873), and his daughter Kezia Waltman (1814-1895). But LaMance apparently was wrong in claiming that Andrew was a son of Conrad. As indicated elsewhere, Andrew was a grandson of Conrad, the son of Conrad's son Valentine (1733-1810?). Thus, her lineage would have been Conrad, Valentine, Andrew, Valentine, and Kezia Waltman. Lora’s mother, Kezia Waltman, married Nelson Irvin Nichols (1812-1865), and they had 10 children, the last of which was Lora Nichols. Nelson Nichols was the son of David Nichols and Nancy King. Nancy, in turn, was the daughter of Deborah Greene King (1767-1820). She apparently was the stimulus for Lora LaMance's genealogical pursuits. Lora's book The Greene Family and its Branches was published in 1904, 24 years before publication of her book on the Waltmans, and it was dedicated to Deborah Greene King. Lora LaMance's later applications for membership in the DAR were based, inter alia, on ancestors in the Nichols and King families, as well as on Conrad Waltman. Lora Nichols attended the Wolcottville schools and Miss Susan Grigg’s Academy, but she did not attend college. On April 14, 1880, Lora married Marcus N. LaMance (1844-1906), a merchant, born in McDonald County, Missouri. She said there was no dissension between the families, although hers had provided soldiers to the Federal side in the Civil War and his, which included slaveholders, had fought with the Confederate army. Kezia Waltman Nichols and Marcus LaMance’s parents lived with Lora and Marcus until they died. Lora, among many other activities, was an active campaigner against the use of alcohol. She became the local and county president of the WCTU, in what she said was the “second wettest county in the state.” Her Waltman book reported proudly that she “put on a hot campaign and took the county dry by local option.” She also worked for women’s suffrage, wrote a history of the Nichols family (her father’s), as well as historical sketches and a series of floral booklets. Marcus LaMance died in 1906, when he was 62 and she was 49. At the time of the death of Marcus, Lora wrote, “the WCTU insisted that she turn all of her energies into temperance channels. It seemed the call of duty.” She became a national organizer and lecturer of the WCTU and, according to her book, “in 21 years she has traveled over half a million miles, spoken in every state and in every Canadian province but two, and has visited over fifty other countries [her penciled amendment changed that to 71 countries] in Europe, Great Britain, Asia and Africa, including Egypt and the Holy Land. She has been in 145 local option, state-wide and national campaigns to banish liquor, and won in all but four . . . . She has spoken from whisky barrels, in front of saloons, in churches, courthouses, picture shows, air domes, on ship, from the back of railroad engines, in factories, fire barns, capitol buildings, and in parks and on the street. 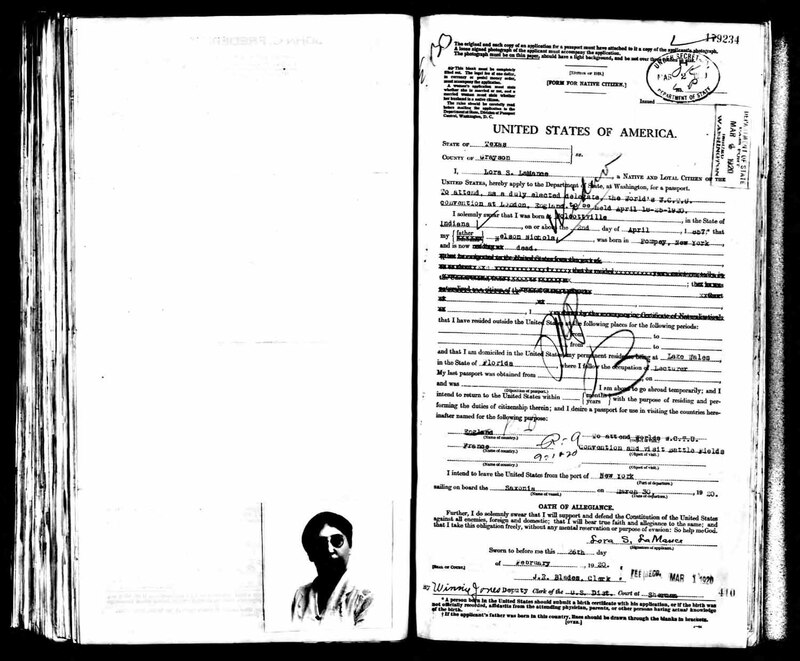 She has given over 12,500 lectures and sermons.” At right is her passport application, submitted in March 1920, when she said she was going to England and France to attend a WCTU convention and to visit battlefields. Curiously, given the amount of travel she said in her 1928 book that she had done in the last 21 years, she suggested that this was the first time she had applied for a passport. Somehow, in the midst of all this activity, she found time to prepare her book on the Waltmans, which was published in 1928. In 1919, when she was 62, Lora Nichols LaMance moved to Florida to live with her daughter Lora Lee Watkins on the shores of Lake Wales. The 1930 census showed them, both widows, living together in Lake Wales, Polk County, Florida. Lora died on May 9, 1939, at the age of 82, and she was buried next to her husband Marcus LaMance in Pineville Cemetery, Pineville, McDonald County, Missouri. Lora and Marcus LaMance had a daughter, Lora Lee LaMance, born January 27, 1881, in Pineville, Missouri. On April 14, 1902, on her parents’ 22nd wedding anniversary, Lora Lee married Joseph Clarence Watkins. Joseph had been born on September 1, 1877, to Joseph Carrington Watkins and Bettie Gamble Alderson. He was a civil engineer and later a major in the first World War. “A finer man, a better man never lived,” LaMance wrote. He died on September 9, 1926. Lora Lee Watkins died in Polk County, Florida, in 1941. Lora Lee and Joseph Watkins had one child, a daughter, Loralee Watkins. She was born on August 2, 1904, in Pineville, Missouri, and graduated from Wesleyan College in Georgia. On the day before her father's death in 1926, Loralee Watkins was married to Robert Leon Johnson of Lake Wales, Florida. Loralee Watkins Johnson died on March 1, 2000, in Lake Wales, Florida. She and Robert Johnson had two children, Robert Leon Johnson, Jr., and Betty Jo Johnson. Robert Jr. inherited the Waltman family Bible and donated it to the University of North Carolina, from which he had graduated in 1952. In 2008, he was living in North Carolina. His sister, Betty Jo Johnson, married Charles Eugene Wildman. Their daughter, Kathy Johnson, contributed information about the LaMance descendants to this report. In 1919, when Lora Nichols LaMance went to live with her daughter, Lora Lee Watkins, they both joined the DAR. Memberships of both were approved by the DAR on February 26, 1919. Lora LaMance’s DAR number is 144950, and Lora Watkins’ number is 144951. Their initial DAR memberships were based not on a Waltman but on David Nichols, ancestor on Lora LaMance’s father’s side. Subsequently, the two Loras claimed DAR membership on the basis of six other people. The DAR verified the claims under these patriots: Samuel King (March 29, 1923), Captain Adam Zerfass (December 1922), Baron Conrad Waltman (October 1, 1926), Andrew Wilson, Andrew Waltman (June 26, 1937), and Captain Magnon Le Roy (King), July 2, 1936. LaMance obviously worked on genealogical research for many years, for her last DAR application was approved when she was 79, just three years before her death. LaMance’s 1926 DAR application on behalf of “Baron Conrad Waltman” cited the Pennsylvania Archives record that a man of the name Conrad Waltman was a private in the Revolutionary War. Her claim of membership said (erroneously, see above) her lineage came from Conrad through his son Andrew Waltman. In this application, she quoted from her own research and said this in turn was based on information that her mother, Kezia Waltman, learned from her grandmother, the wife of Andrew Waltman. 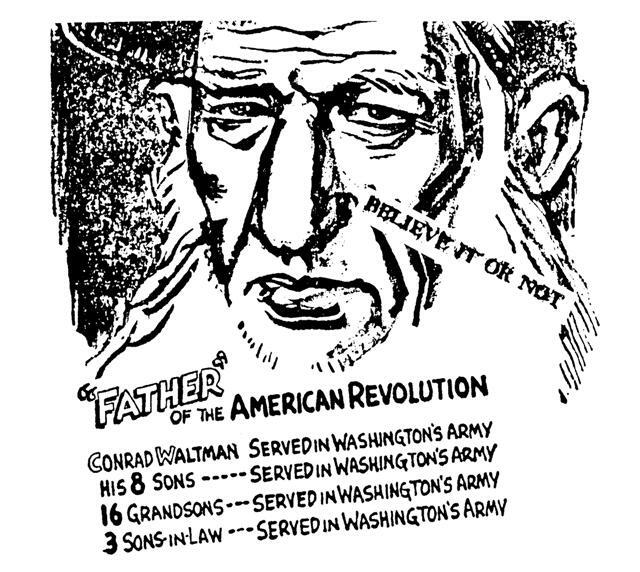 Conrad Waltman, the immigrant (Conrad Sr.), is not the Conrad Waltman mentioned in Pennsylvania Archives as having been in the Revolution. 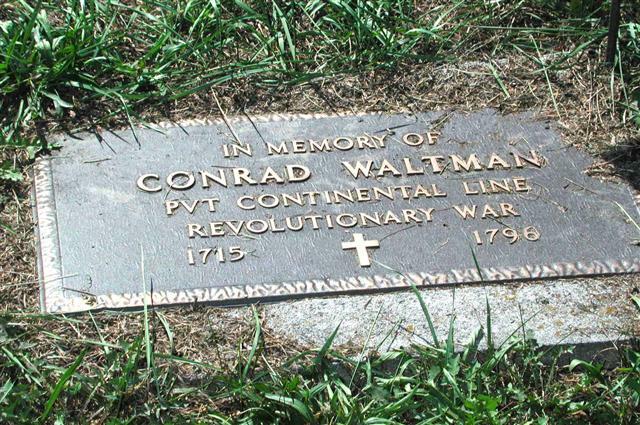 The Conrad Waltman who served in the war was his grandson (call him Conrad, Jr.), 1759-1785. Although 17 women have joined the DAR claiming their family history relates back to Conrad Sr., using LaMance as the source, the DAR has now suspended applications making that claim in the absence of further proof. However, women can join the DAR citing Conrad Jr. as the family ancestor. The plaque in the Kreidersville Cemetery that says Conrad Sr. (1715-1796) fought in the Revolution is not correct and unfortunately has been misleading to researchers. It has not been authorized by the DAR and is not a DAR plaque. Apparently it was supplied by the Veterans Administration on the basis of a flawed claim based in part on the LaMance book. LaMance did not believe that a person named Conrad Jr. existed, and so he is not mentioned in her book at all, despite clear genealogical evidence to the contrary. Conrad Jr. was a son of Valentine Waltman, a son of Conrad Sr.
Peter Waltman (1779-1836) was a son of Conrad Jr., and not a son of Valentine. Peter had three siblings, all children of Conrad Jr. Both Maria Barbara Waltman, who was born in 1781 and married George Gruber, and her brother Johannes Waltman, born in 1783, moved to Lycoming County. At least two researchers were exploring the details of their lives in 2008. A third sibling, Elizabeth Catherine Waltman, born in 1784. apparently also survived to adulthood. Valentine Waltman probably was born before 1733, not in 1742, and must have come to America with Conrad Sr. in 1738. (Conrad’s twin girls, reportedly born in 1738, apparently were not his first children.) Valentine’s wife was named Catherine Brucker, not Catherine Bieber. It was his son, Conrad Jr., who married Catherine Bieber. Apparently, Conrad Sr. did not have a son named Andrew/Andreus, born in 1760, as LaMance said. It appears LaMance confused him with the Andrew Waltman, born in 1765, who was the son of Valentine. There is evidence of only one Andrew of that age in the area at that time, and Katherine Waltman likely was too old to have had a child in either 1760 or 1765. The Andrew Waltman who married Margretta Zerfass and fought in the Revolution appears to have been the son of Valentine. LaMance said that Andrew the son of Valentine went to Sabuta, Mississippi, but it appears that the family member who went to Mississippi was not Andrew but John Waltman, born in 1789, a son of Andrew and Margretta. The date of birth of Katherine Waltman that is shown on her tombstone, 1708, is probably correct. LaMance said it was wrong and should have been 1718, probably in order to make it more likely Katherine had children over such a long period of time. This may suggest that Conrad Sr. also was born earlier than 1715. Elizabeth Waltman, daughter of Conrad Sr., who married John Dreisbach and is buried in Kreidersville, was totally omitted from the LaMance book. These are some of the major errors that appear in LaMance’s book, and there were other small ones, mostly related to her claims regarding the children of Conrad Waltman Sr. Besides these, a major omission is any genealogical evidence of the very existence of Conrad Sr. He was shown by LaMance and other researchers arriving in Philadelphia in 1738 and being present at the baptism of only one of his children, Anna Barbara, in 1745. But there is no other evidence of Conrad – no evidence in tax records, oaths of allegiance, church attendance, baptismal ceremonies, wills, land records, burial, tombstone, or anything other records. LaMance implied Conrad lived in the Kreidersville area, but there is no evidence of it, and finding this evidence seems to be a major challenge for future researchers. See more details of these genealogical issues in Part II of this paper. An Interesting Puzzle. A special curiosity regarding LaMance's research is that, although she presented herself as the confident expert on the Waltmans, her 1904 book on some of her other ancestors, The Greene Family and Its Branches, mentioned the Waltmans only very briefly. In this book of 394 pages, only pages 247-250 related to Waltmans and descendants (these pages can be viewed on the pdf version of the link above). Most surprisingly, these pages do not mention Conrad Waltman. Instead, they suggest that the progenitor of the Waltman family, Valentine Waltman of Germany, had a son, also called Valentine, who traveled to America with "Miss Bierly," and among their children was a John Waltman, whose "proud little wife" was "Anna Maria Marguerite (Surface)," and they had a son Valentine Waltman, who married Achsa Wilson. In short, this 1904 account omitted the immigrant Conrad Waltman who was the focus of her 1928 book, suggested that the Valentine Waltman who traveled to America was married to "Miss Bierly" (her second book said that it was the immigrant Conrad who married Katherine Bierly), and indicated that the man who married Margretta Zerfass was not Andrew Waltman but "John" Waltman. Thus, there were major errors in her account of the Waltmans in the 1904 book, exacerbated by her account in the 1928 book. I think that the bulk of the Greene book was written during the latter part of the nineteenth century. Nelson Nichols (Lora's father) died in Ohio in 1865, and around 1878 Lora and her mother Kezia ended up in Missouri. This was a sparsely populated area, and with the two women in the same house there would be ample opportunity for sharing of family history. [Kezia Waltman Nichols died in 1895.] With the publication of the Greene book in 1904, the death of Lora's husband Marcus in 1906, and the marriage of her only child, there was time to concentrate on the other side of the family. Her travels for the WCTU took her all over this country, providing opportunities for research and writing. I have newspaper clippings from 1912 to 1927, from Miami to Alaska, showing her speaking engagements. I have some of her original papers on "The Southern Watkins Family," which she wrote after her son-in-law joined the family. There are 8 pages and she incorporated some of the information in the Waltman book. I imagine that family history was a lifelong passion as it is for so many. As indicated earlier in this chapter, a fair amount of what was written by LaMance about the Waltmans was greeted with skepticism. She claimed she got the information from her mother, who got it from her grandmother, but LaMance seems to have been very liberal in presenting fact and opinion regarding the immigrant Conrad Waltman and his descendants. She was contested strongly on her view that Conrad had served as a private in the Revolutionary War and on her opinion that there never was a Conrad Waltman Junior. As indicated here, Margaret Wilkins presented evidence to the DAR to try to prove that LaMance’s 1928 book had many errors. More detail on this dispute is presented at the end of the next chapter. Lora LaMance clearly was not deterred from her genealogical mission by any of the criticism. Her book on the Waltmans remains as the main source of information for many researchers, despite the efforts of others to point out problems. In addition to the notes and “corrections” supplied by Margaret Wilkins, the copy in the DAR library contains a pasted-in page of Errata from LaMance herself. The page noted that much new material had arrived after the first 13 chapters had been sent to the press. It said that LaMance fell and broke her right shoulder at the age of 71 and had to dictate changes to a stenographer, and some errors, presented in the errata sheet, did not get corrected. The changes, however, did not appear to affect the text relating to Valentine or Peter Waltman or their descendants. Nor was the substance changed by comments that she penciled into her copy of the book after it was published. Neil A. Boyer, of Silver Spring, Maryland, is the author of The Boyers of Easton, a 319-page book, published in 1987, with more than 300 photographs, focusing on Lewis Elmer Boyer (1869-1948), of Easton, Northampton County, Pennsylvania. That book traced the Boyer family backward from Lew Boyer to his ancestors, as far as Johann Friedrich Boyer (1718-1804), who sailed to America from Rotterdam aboard the Nancy in 1752, and the book went forward to Lew Boyer’s children and their children. Lew Boyer’s wife was Henrietta Waltman (1874-1948), and the book included a lengthy chapter on the Waltman family. This paper grew out of an effort to bring the Boyer book up to date, drawing on new information and the growing potential of the internet for genealogical research. The Waltman material in this account is significantly expanded. See more about Neil Boyer here. Neil Arthur Boyer (1938- ). Corrections to this material and supplemental information are welcome. Please contact Neil Boyer at 702 Twin Holly Lane, Silver Spring, Maryland 20910, or by email at naboyer@comcast.net. LaMance, Lora S., The House of Waltman and its Allied Families, private printing, The Second Company, St. Augustine, Florida (1928), available in the Easton, Pennsylvania, Public Library, the library of the National Society of Daughters of the American Revolution (NSDAR), in Washington D.C., and elsewhere. Although the book is long out of print, Higginson Book Company advertised on its web site in 2005 that the book could be ordered at $40 for a paperback version and $52 for a hardback. Howard E. Snyder, a descendant of Conrad Waltman’s son William, purchased LaMance’s own copy of the book from her family. That copy contained handwritten annotations and corrections that she made after the book was published. Snyder had photocopies of this copy spiral bound, and in early 2006 still had a few copies available for sale. See Howard E. Snyder, 10712 West Beach Parkway, Lake Wales, Florida 33898-8334, hsnyder@seidata.com. LaMance’s book seems to be the starting point for most Waltman genealogists. It is quoted extensively in virtually every account of the Waltman family, although many readers have cited inconsistencies or errors in the text, and people have wondered what basis LaMance had for the detailed information that is included, going back to the 1600s. See the critique of her book in this section. LaMance and her daughter, Lora LaMance Watkins, were approved for DAR membership on February 26, 1919, on the basis of the patriot status of another person, and then, on October 1, 1926, they were the first women to join the DAR on the basis of the “patriot” status of Conrad Waltman Senior. By early 2006, 15 others had followed suit, although the DAR by then had doubt about whether Conrad Senior had actually been in the Revolutionary War, and it would no longer accept applications for DAR membership based upon Conrad Senior without additional genealogical proof of his record. DAR Numbers 144950 (LaMance) and 144951 (Watkins). See the separate note on LaMance at the end of this chapter. Margaret Callaway Bright Wilkins (Mrs. Emilton L. Wilkins, 1901‑1980), of Portland, Oregon, did extensive research into the Waltman family. She was a daughter of Thomas Joseph Bright (1875-1927), of Easton, granddaughter of Mary Margaret Waltman Bright (1840‑1925), great-granddaughter of Joseph Waltman (1806-1898), and a great-great-granddaughter of Peter Waltman of Allentown (1779-1836). As noted elsewhere, she disagreed with some conclusions of LaMance. In 1950, after correspondence with the Rev. Melville Schmoyer, she submitted to the DAR a page of clarifications and corrections to the LaMance text. In 1961, she hired a genealogist, Hannah Benner Roach, to search Waltman records in Pennsylvania. Byron Waltman's report of 1962 said that Margaret also was contemplating hiring someone to research records of the Lutheran Church in Europe. However, she apparently was distracted or got no support, and the project never was undertaken. DAR Files 338019 and Add 385. See further information here. Beaver, Reverend Irvin M., History and Genealogy of the Bieber‑Beaver Family, Reading, Pennsylvania (1939), available in the Easton Public Library and the DAR library in Washington. The book is 984 pages long and names approximately 20,000 members of the Bieber family born over a period of four centuries. A website on the Beaver genealogy is http://home.att.net/~long.hair/bieber/main.html#new. Rev. Beaver was born on November 25, 1868, a son of Samuel and Sarah Beaver of Grantville, Huntingdon County, Pennsylvania. The 1920 census showed him, age 51, as a church minister in Reading, living with his mother, 70. He applied for a marriage license in 1921, and the 1930 census showed him, age 61, living with his wife, the former Hattie Ganster, 40, daughter Kathleen, 6, and daughter Elizabeth, 5. No record of his death could be located. Rev. Melville B. C. Schmoyer was born on October 12, 1871, in Macungie, Lehigh County, and died on July 12, 1953, in Allentown. He was buried at Zion (Lehigh) Lutheran Church in Alburtis. He graduated from Philadelphia Seminary in 1896, and was a pastor in churches in Mauch Chunk, Hazelton, Macungie and other places. A very active genealogist, he published a book entitled Schmoyer Family and Allied Lines of: Diehl, Frederick, Hinkle, Keiser, Kline, Klinefelter, Meyer, Nice and Rex. He also wrote Our Kin and Antecedents. Both are out of print. Melville B. C. Schmoyer was a son of John Benjamin Jacob Schmoyer, who was born in 1848 and had married Matilda Meyer, the daughter of Charles and Maria Waltman Meyer. Maria (1810-1900) was the third child of Peter Waltman. Thus, Peter Waltman (1779-1836), of Allentown, was Melville Schmoyer’s great-grandfather. LaMance discussed Melville Schmoyer on pages 91 (including a photograph) and 208 of her 1928 book, and said that Melville had compiled a list of 13,000 to 14,000 names among Schmoyer descendants. His 1948 letter to Wilkins, discussed in this chapter, was written when he was 77. See the website of the National Genealogical Society https://www.ngsgenealogy.org/comhallmembers.cfm#roach. Waltman, John Byron, The Descendants of Joseph Waltman, typed manuscript (1962), dispatched to "All of the Waltman Descendants," available in the Easton Public Library. Byron Waltman (1890‑1968) was a son of John Augustus Waltman (1851‑1909), who was a brother of Henrietta Waltman's father, Samuel Waltman (1832‑1911). Byron was thus a cousin of Henrietta. Byron Waltman's paper, A List of the Descendants of Jacob C. Wirebach (1808-1877), provides detail on the inter-relationship between Waltman family and the Wirebach family of South Easton. See also the section on John Augustus Waltman (1851-1909). Dorothy Waltman Ware, of Whittier, California, was born on January 15, 1911, and died December 21, 1994, at the age of 83. She was a daughter of Burton Brassington Waltman (1889‑1959), granddaughter of Marcus Hallbach Waltman (1865-1944) and his wife, Maria Brassington, great-granddaughter of Jacob Franklin Waltman (1835‑1923), and great-great‑granddaughter of Joseph Waltman (1806‑1898). She applied for membership in the DAR in 1978, on the basis of the patriot status of Conrad Waltman, Junior, through his son, Peter Waltman. DAR number 631270. In 2007, Dorothy's daughter, Jeannette Ware Ehrlich, of Bend, Oregon, was continuing her research into the family. Harry Cameron, of Levittown, Pennsylvania, did extensive research into the Waltman family and compiled impressive family charts and collected hundreds of newspaper clippings, photographs and other souvenirs relating to virtually all of the descendants of Joseph Waltman (1806‑1898). Harry (b.1942) was the son of John Henry Cameron, Jr. (1899‑1975), the grandson of John Henry Cameron (1859‑ 1934), the great‑grandson of Adaline Waltman (1831‑1910), who married William Wallace Cameron, and great-great-grandson of Joseph Waltman (1806-1898). Adaline was a sister of Henrietta Waltman Boyer's father, Samuel Waltman. Charles Waltman was the only son of Arthur Waltman (1866‑1943), who was a brother of Henrietta Waltman Boyer. Charles was, therefore, a first cousin to the seven children of Lewis Elmer and Henrietta Waltman Boyer and was often welcomed at Boyer family gatherings. Charles and his wife Minerva were also welcomed at the 1987 reunion of the Hower family in Howersville. The Waltman linkage to the Howers is described below in this chapter. Estimate attributed by Byron Waltman to Leslie Waltman of Oklahoma City, supposedly focusing only on the direct descendants of Conrad Waltman and not on Waltmans deriving from other immigrant ancestors. LaMance, page 1 and pages 210-216. She actually made brief reference (a few pages in her lengthy book) to the presence of other Waltman lines in America but dismissed them as minor. Frances Geraldine (Jerry) Waltman Baker (b. December 4, 1944), did extensive research on the “Emanuel” line and provided Neil Boyer with charts and other background on this family. She said that the LaMance book made brief but incomplete reference to this line. She found the German roots of the family through research at the Salt Lake City Genealogy Library (German film 247,591), 1710-1793, city of Billigheim, Rheinland Pfalz. Appenhofen is a small village near Billigheim. Another source of information on this line is a paper, “The Emanuel Waltman Family of Virginia,” compiled and presented to the DAR by Edythe Wilson Thoesen, of Boulder, Colorado, about 1935. The Chenoweth family website provides links to other people named “Waltman” or “Waldman” or “Waltmans,” who claim to be descended from other immigrants of this name (http://chenowethsite.com/genealogy/walother.htm). One of the writers contended that “the name of Waltman or Waldman is and was very common in the south of Germany. Waltman is a very old name. Now it is mostly written as Waldman(n). In Germany it has happened that many churchbooks have disappeared. So, it is very difficult to search your family tree earlier than the year 1700.” See also the Waltman Family Genealogy Forum, at http://genforum.genealogy.com/waltman/. Schaffhausen also was possibly the home of the ancestors of Lewis Elmer Boyer. See chapters on the effort to determine the family origin of Johann Friedrich Boyer. LaMance, pages 35 and 38. LaMance, page 40. This observation was also made in a note from Barrett L. Peters, another Waltman family researcher, who is descended from Hiram Michael Waltman, one of the many children of Katherine and Conrad Senior, email, January 11, 2002. Pennsylvania Archives, Second Series, Volume 17, page 170, said that the Davy sailed from Rotterdam, not Amsterdam, and that the passengers "qualified" in Philadelphia on October 25, 1738. LaMance and Byron Waltman also said the Davy sailed from Rotterdam. However, the ship log, viewable on several websites, makes it clear it sailed from Amsterdam. Fourteen years later, Johann Friedrich Boyer, the immigrant ancestor of Lewis Elmer Boyer, made almost exactly the same journey – Germany to Holland to Philadelphia -- aboard the Nancy, and then northward to eastern Pennsylvania. “Conrad Waldman” can be seen in the ship lists in Hinke, William J., ed., Pennsylvania German Pioneers, Norristown (1937), Volume I, pages 234-236, List 61-A-B-C, Palatines Imported on the Ship Davy. The original book is Strassburger, Ralph Beaver, Pennsylvania German Pioneers: A Publication of the Original Lists of Arrivals in the Port of Philadelphia from 1727 to 1808, edited by William John Hinke. Norristown [PA]: Pennsylvania German Society, 1934. 3 vols. Vols. 1 and 3 reprinted by Genealogical Publishing Co., Baltimore, (1964 and 1980). The three-volume set provided a printed list of ship passengers in Volume I, facsimile pages showing the actual signatures of the immigrants in Volume II, and an index to the entire set in Volume III. (There are different versions of this work. The set in the DAR library in Washington had the signature facsimiles in Volume III, which was a 1992 reprint of the 1934 version.) For the Davy in 1738, Volume I, pages 233-235, showed List 61-A, a captain’s list, which said there were 141 on board, 94 men and 47 women, but it gave the names of only the men. List 61-B showed the 40 men who signed the oath of allegiance, and List 61-C showed the same 40 men as they signed the oath of abjuration. In each of the last two lists, the name of Conrad Waldman was shown as having signed with an “X.” Volume II, pages 241-42, showed the signatures. Beyond Germanna was a newsletter-journal was published by John Blankenbaker for fifteen years from 1989. With the November 2003 issue, publication ceased. According to its website, all of the fifteen volumes were still available in print format by the year or by the issue. Its website and newsletter focused on the ancestry of Germans who settled in Virginia. See http://www.germanna.com/. See the story of the Davy’s voyage at http://homepages.rootsweb.com/~marier/Germanna.htm. This is drawn from an article “The Emigration Season of 1738 – Year of the Destroying Angels,” which appeared in The Report, A Journal of German-American History, volume 40, published by the Society of the History of the Germans in Maryland, 1986, and quoted by Klaus Wust, Edinburg, Virginia, in Beyond Germanna, Volume 10, Number I, January 1998. Davy, 1738, ship passenger list. https://sites.rootsweb.com/~GENHOME/imm16g.htm. Palatines imported in the ship Davy, Wm Patton, Commander, from Amsterdam, last from Cowes – 180 passengers. http://www.searchforancestors.com/passengerlists/davy1738.html. The ProGenealogists site, http://progenealogists.com/palproject/pa/1738davy.htm, is the one that includes some women and children. This is the site for the Davy. There is one contribution to Ancestry.com that says Johannes George Byerly, born June 9, 1661, in Kandel, Germersheim, Rheinland, Germany, was married to Anna Maria Stoll, born in 1678. They had five children, according to this site: John Jacob Byerly, born in 1700; Frederick Beyrle, in 1702; William Beyrle, in 1704; Anna Maria Beyrle, in 1708; and Katherine Bierly, born in 1718 in Bavaria. This site says that Katherine married Conrad Waltman, but does not say where or when. LaMance said that Katherine’s sister Anna Maria married Adam Miller after arrival in America. She thought that the marriage of Anna Maria and Adam became part of the Andreus Waltman strain of the family. See http://trees.ancestry.com/owt/person.aspx?pid=32406477. The county genealogy is this: Bucks County was one of three large counties created by William Penn in 1682. Northampton County and Berks County were carved out of Bucks County on March 11, 1752. Lehigh County, where some of the Waltmans lived, was carved out of Northampton County on March 6, 1812. See the note at the end of this chapter on the development of counties and townships in the area. A record of Zion Church (found in the DAR Library), written by Laura M. Helman, a descendant of Simon Dreisbach, Sr., said the building committee consisted of Adam Dreisbach, Simon Dreisbach, Jr., and Casper Erb (all from the Reformed Congregation) and Valentine Waldman, George Edelman and George M. Bastian (from the Lutheran side). The two-acre plot sold for three pounds and adjoined an existing 700-acre plot. The land for the church was purchased from Peter Friedt, and the deed said it was “to be used for divine worship in the church already built on the lot and to erect churches or school houses to educate their children ‘in the German tongue.’” Northampton County Deed Book C-1, pages 13-15, December 7, 1770. Similar information is in a booklet produced by the church itself, Burial Record of Zion’s Stone Church, Kreidersville, July 1, 1940. This booklet contains a history of the church and the cemetery, as well as a listing of all individuals buried there (to the extent that the tombstones could be identified) up to 1940. Kreidersville can be reached from Route 248 on the north. That road goes from Easton to Nazareth to Bath and on to Walnutport. Traveling west from Bath, the two-lane road goes about three miles before an intersection with flashing yellow lights and a sign marking a left turn to Kreidersville. The Kreidersville road is also called Walnut Drive. The church is about three-fourths of a mile south of Route 248. Pennsylvania Archives, Third Series, Volume 19. Heads of Families, Pennsylvania, at the First Census of the United States Taken in the Year 1790, Government Printing Office, Washington, 1908, Northampton County page. The 1790 census can also be viewed on the genealogical website Ancestry.com. See also the article by Wright, James, “Zion Church Dates Back More than 150 Years,” Easton Express, February 8, 1987. Pennsylvania Archives, Fifth Series, Volume VIII, page 538 [538 is the correct page number for the appearance of Conrad’s name, not 537, as in the Bieber account, quoted below, although the list of soldiers under Captain Rundio begins on 537], and Third Series, Volume XXIII, page 455 (same list of 45 soldiers repeated). The Archives account uses the name “Peter Rundio (Rundis).” All other accounts of the man use the name Rundio. The parenthetical word probably means that this group was known familiarly as “Rundi’s Company,” but the real name was Rundio. Deary, William Paul, "Toward Disaster at Fort Washington," November 1776, a dissertation submitted to the Faculty of the Columbian School of arts and Sciences of the George Washington University, in partial satisfaction of the requirements for the degree of Doctor of Philosophy, May 19, 1996, privately printed, copy in the DAR Library in Washington, page 182, note 28. This lengthy book is an excellent account of the faulty military strategy that led to the surrender of nearly 3,000 American soldiers to the British on November 16, 1776. The book includes hundreds of footnotes that link to additional research into the Fort Washington surrender. See also, Linn, John Blair, and Egle, William H., editors, Pennsylvania in the War of the Revolution, Battalions and Line, 1775-1783, Harrisburg, 1880. Volume I, pages 104-05. For a more popular version, see the website of Washington Heights, http://www.washington-heights.us/history/archives/battle_of_fort_washington_35.html. Pennsylvania Archives, Fifth Series, Volume VIII, page 535. Fritts, Peter, History of Northampton County, Pennsylvania, with Illustrations Descriptive of its Scenery, Philadelphia and Reading (1877), oversized book, page 58. Peter Fritts apparently is the publisher of the book, and he is described as “successor to A. M. David.” This is also known as the “Ellis book,” after Captain F. Ellis, the book’s historian, who apparently did the writing but did not receive top billing on the cover page. The book is available in the DAR Library, Washington, and in the library of the Northampton County Historical and Genealogical Society, in Easton. The Scotch-Irish of Northampton County, Pennsylvania, pages 152, 242, quoted in the DAR application of Myrtle Brown Lease, 1918. Fritts, page 275. This document appears to have come from the Honorable Charles Brodhead of Bethlehem, who said this and other papers had been in the possession of Mrs. William Brown, a daughter-in-law of Robert Brown, First Lieutenant with Captain Rundio’s company. The original source of the document was not revealed. Fritts, page 275 (misnumbered as 257 but in the correct order). A virtually identical text, addressed to British General Howe, was signed by Second Lieutenant John Crawford much earlier, on November 19, 1776. Crawford wrote on November 21 that he was still a prisoner, without clothes or money, “except what was on me when I was taken,” and asking his father and mother for both money and clothing. Copies of these and other Crawford letters are in the DAR Americana Collection, under accession numbers 2278-2285. Fritts, page 240. See http://bioguide.congress.gov/scripts/biodisplay.pl?index=B000942 for a biography of Lt. Brown. A DAR applicant in 1918, Myrtle Brown Lease, DAR Number 142048, cited this same account. The DAR review of Myrtle Brown Lease’s application included reference to the book History of the Lehigh Valley, Volume I, page 274. Bishop, Morris, “A French Volunteer,” American Heritage Magazine, Volume 17, Issue 5, August 1966, on line at http://www.americanheritage.com/articles/magazine/ah/1966/5/1966_5_46.shtml. Heitman, Francis B., Historical Register of Officers of the Continental Army during the War of the Revolution, April 1775 to December 1783, Rare Book Shop Publishing Company, Inc., Washington, D.C., 1914. The website that says Shimer (1749-1838) became a justice of the peace in Williams Township is http://awtc.ancestry.com/cgi-bin/igm.cgi?op=GET&db=shine71&id=I80. DeMois, Dr. F. A., A History of the Werner Family, Allentown, 1928, noting that Jacob Werner/Warner served in the Northampton County Militia, Continental Line, 1780-84. Quoted in Deary, page 413. Date supplied by Irene D. Konrad (Mrs. William A. Konrad), of Boca Raton, Florida, DAR Member 760557. Fiedler is a descendant of John Peter Waltman and his daughter Anna Barbara, who married Peter Anewalt, Senior. See the footnote below for more information about his links to the families in the area. In 2006, Fiedler lived at 7026 Bausch Road, New Tripoli PA 18066-2407. Related information about Zion Church Cemetery and the families who lived near Kreidersville came from Norman J. Borger, local historian and genealogist, who in 2006, age 90, lived near Zion Church. He provided extensive information about the cemetery when he was visited by Mildred Boyer Harris in 1991. Borger lived on Walnut Drive in Northampton, Pennsylvania 18067. The marker for Conrad Waltman was placed in the Kreidersville cemetery in 1986 by William J. Fiedler, Jr., and Aaron Hower of New Tripoli and possibly other family descendants. William Fiedler is descended from several families who lived in the Kreidersville area in the 1700s – the Waltmans, Anewalts, Dreisbachs and Howers. Bill’s father, William Jacob Fiedler (1911-1970) married Edna Saylor Hower (1911-1974), who was the daughter of Lloyd Clarence Hower (1880-1959) and a granddaughter of Thomas Hower (1854-1928). Thomas Hower’s father, Aaron Hower 1823-1867), was the son of George Hower (1798-1886), who was married to Catharine Anewalt (1802-1884). Catharine, in turn, was the daughter of Peter Anewalt (1772-1825) and Anna Barbara Waltman (1777-1853), who was a daughter of Conrad Waltman’s son John Peter Waltman (1741-1817) and his wife Maria Elizabeth Boyer (1751-1831). George Hower was the son of Johann Nicholas Hower (1751-1824) and Elizabeth Dreisbach (1762-1839). Elizabeth Dreisbach was the daughter of Simon Dreisbach, Jr. (1730-1806), granddaughter of Simon Dreisbach, Sr. (1698-1785), and the niece of John Dreisbach (1735-1796), who married Elizabeth Waltman, a daughter of Conrad Waltman, Senior. Thus, these four families were intricately intertwined. See more details in the chapter on the children of Conrad Waltman. To bring the links up to modern times, the Hower Family Reunion in 1987 welcomed as guests Minerva and Dr. Charles Waltman (1906-1995), of Easton, Pennsylvania, a prominent descendant of Conrad Waltman Senior, Valentine, Conrad Junior, Peter and Joseph Waltman (see Part III of the Waltman Family for more on Charles Waltman). The letter, bearing the official Seal of the Pennsylvania Department of Public Instruction, was dated May 4, 1928. Although addressed “To Whom It May Concern,” the date gives the impression it was sent to LaMance as justification for her 1928 book. The letter was duplicated on page 45 of the book. The plaque at Zion Church in Kreidersville, honoring 60 soldiers, was dedicated on September 21, 1931. The list contained eight solders by the name Dreisbach, including John Joseph Dreisbach, the husband of Elizabeth Waltman, a daughter of Conrad Senior. Burials of Revolutionary Soldiers in Northampton Co. (now Lehigh Co.) Penna, compiled by Sadie F. Horning Ziegler (1937), page 25, DAR Library in Washington, D. C.
 Rev. Beaver was not clear about whether Conrad Senior or Junior was the one living in Dryland, but most likely he meant Conrad Junior, since the Schoenersville area of Dryland was the apparent home of Valentine Waltman, the father of Conrad, Junior. A note on Trockenland, or Dryland, is at the end of the next chapter. In 2006, Christ Lutheran Church of Schoenersville, a few miles north of Allentown, was located at 2354 Grove Road, a short street that connects Schoenersville Road with Airport Road. The long narrow cemetery is across the street from the church. The older tombstones, most of them illegible, are on the end of the cemetery across the street from Lehigh Valley International Airport. Not far away, at 5050 Airport Road, is the site of the relocated Reformed church, known in 2006 as Christ United Church of Christ. Andrew/Andreus Waltman, born 1760, died 1829, married Anna Marie Marguerite Zerfass. Private, Pennsylvania. Conrad Waltman, Junior, born February 7, 1759, died December 3, 1785, married Catherine Bieber. Private, Pennsylvania. Michael Waltman, born 1754, died August 24, 1829, married Mary (Polly) Prutzman. Private, Maryland. Soldier and widow both pensioned. Peter Waltman, born May 9, 1741, died November 9, 1817, married Mary Elizabeth Boyer. Private, Pennsylvania. Note that three men believed by LaMance to be sons of Conrad Senior are included, although Andrew seems quite clearly not to be a child of Conrad. Conrad Junior is a grandson. Another son, Valentine Waltman, is not included, although there is a clear record that Valentine was a Second Lieutenant in the Northampton County Militia, as recorded in Pennsylvania Archives, Fifth Series, Volume VIII, pages 303 and 309. DAR staff said in 2005 that, although it appears that Valentine Waltman was a participant in the Revolutionary War, he is not included as a patriot in the DAR files because no descendant has applied for DAR membership on the basis of Valentine’s service. The same appears to be true in regard to four other sons of Conrad Waltman, Senior – William, Ludwig, Frederick and Nicholas. Byron Waltman wrote in 1962 that female members of the family could claim DAR membership through four individuals: Valentine Waltman, Conrad Waltman Junior, Michael Bieber (the father-in-law of Conrad Junior), and Valentine Fatzinger (father-in-law of Peter Waltman). He also omitted Conrad Waltman Senior. The last three members accepted by the DAR based upon their descent from Conrad Waltman Senior were a California woman and her twin daughters with the last name of Mayer. Their applications were approved about the same time in 1985. They said their lineage went back to Conrad Waltman through his daughter Margaret, who married John Yonce. Margaret was one of the twins that LaMance said were born to Conrad Waltman in 1738,. Thus, these three applications depended upon the “patriot” status of Conrad Senior, which had been called into question, and not on the service of one of his sons. Apparently these three applications led the DAR genealogy staff to examine whether Conrad Senior was in fact a “patriot,” in the sense that he had participated in the War. This issue led to the notation in the DAR computer files that future applicants claiming Conrad Senior as a patriot would need to prove the line of descent. In essence, this suspended further DAR membership based upon Conrad Senior unless convincing proof of his military service were submitted. LaMance, pages 59 and 146-148.